The book of Acts unfolds as an historical narrative of the early church, the activities of the first followers of Jesus and those who join them. For the most part, Acts simply describes what happens, with little commentary and few instructions for proper conduct. 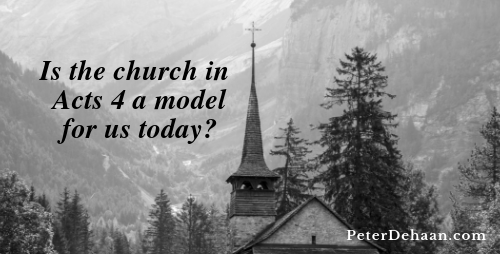 While we can look to Acts as a possible model for church life, we would be in error to treat it as a requirement for right behavior. In this way Acts can inform us today, but it doesn’t command us. For example, if I wrote, “My church went to a baseball game after the service,” no one (I hope) would think I was saying that attending baseball games is prescriptive of church life. No. It was merely descriptive of what one church did one time. We would never build our theology on a statement like that. Unity: The Acts 4 church is of one heart and mind, just as Jesus prayed that we would be one (John 17:21). Their actions are consistent with Jesus’s prayer. Jesus prayed it, and the early church does it; I hope unity describes every one and every church. Community Minded: In the Acts 4 church, no one claims their possessions as their own. It isn’t my things and your things; it is our things. They have a group mentality and act in the community’s best interest. While we might do well to hold our possessions loosely, notice that this isn’t a command; they just do it out of love. While these three characteristics should inspire us to think and behave differently, and can provide a model for church life, we need to remember that the Bible gives us no commands to pursue a communal-type church. We can, but it’s one option. Of the three only unity rises as an expectation because Jesus yearns for it to be so. That should give us plenty to do.